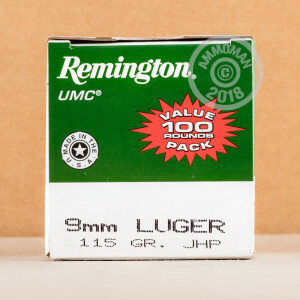 Remington’s UMC division specializes in crafting ammo that satisfies the specifications most frequently favored by American shooting enthusiasts. 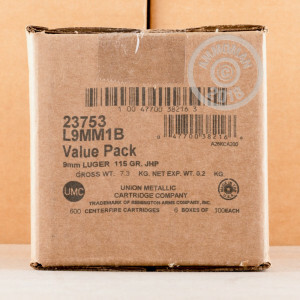 By limiting their production to only the most popular ammunition products, UMC is able to supply them in quantities great enough to merit their very appealing price tags. 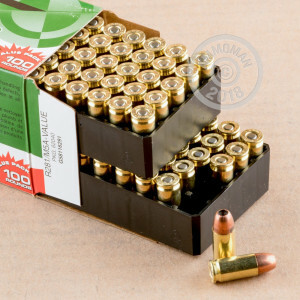 This 9mm cartridge is specialized for self-defense, and its 115 grain bullet is the most popular weight for that purpose. The bullet has a jacket which assures it’ll feed reliably in a semi-automatic weapon, whether it’s a pistol or an AR-15, and which further assures it can penetrate targets. Once within a human-sized target, this round’s hollow point will cause it to mushroom rapidly in order to increase its likelihood of striking a vital. For the relatively little that it costs, this round presents a stellar opportunity to train and become proficient with the same ammo you might one day have to rely on dearly. To add even more value, you’ll be able to make a good project from this round’s brass casing at a reloading bench.